Phew, that was a whirlwind of a week. Just over one week ago I finally released Bookie 0.4 and published the blog post to reddit as an announcement. This introduced signups and I was eager to see if there was real interest in the project now that users could sign up and try things out. The blog post picked up 800 visits over the two days in the weekend. https://bmark.us grabbed 360 unique new visitors. We went from 58 to 126 activated user accounts. Those users brought us to over 26,000 bookmarks stored in the site. Of course, any swarm of new users finds the holes in the system and Bookie was no different. There were a few issues. First, the celery task that sends out emails on signup wasn't running because the email config wasn't setup right. This was a pretty quick fix. Next, the import system wasn't filling out the path for uploaded files correctly. This one was another pretty easy fix, but I managed imports manually until I got the fix deployed. The big thing was that, for probably the first time, all three moving parts to the system were trying to store bookmarks at once. The celery backend, the web UI, and a cron script that looks for new bookmarks without readable content and fetches it for storing. All of these hit the Whoosh fulltext index and caused locking issues that broke both imports and saving new bookmarks from the webui until I figured out the issue and just reset the fulltext index. It was pretty bad timing as I could see users trying to add test bookmarks via the web interface. Google realtime analytics is pretty entrancing to watch. In the end I had to run to the Whoosh docs and change things up to use the async writer instead of the default locking mechanism. This got things running again, but the problem now is that I had to remove all the existing fulltext index. I've still got to finish a background job that will walk through all bookmarks and index them. At some point I might need to remove the fulltext indexing from the current SqlAlchemy event hooks, but as purely background celery jobs that I can control from one place easier. This would remove the lock at all from the cron job and the web ui. While I could see the charts showing traffic, it was tough because it was pretty invisible traffic. There were only three new users into the #bookie irc channel, and only a few people left comments in the reddit thread. No one left a comment on the blog post. Both my Twitter account and the Bookie accountgained fewer than 5 new followers. While the repository was starred many times, only two forks were created. There are a few new users active over the last week, and I've gotten a pair of pull requests. While the saving of new bookmarks was broken for a lot longer than I'd have liked, the site never went down. Imports were done in a semi-reasonable time frame. All of this felt pretty great and is encouraging for future work. I still need to finish fixing up the readable parsing. It's the big selling point of Bookie, and the fact that fulltext search and readable parsed content for all bookmarks isn't there is frustrating. Here's looking forward to great work and a more popular release announcement for Bookie 0.5. Bookie 0.4 released into the wild! Bookie is a Python based open source bookmark managing web application that includes content archiving, a Chrome extension, and much more. Phew, that took a lot longer than expected. I've tagged Bookie 0.4 and the live site is updated to run it. This brings a ton of work on getting an updated webui with some client side MVC, an API, Celery job running backend, some stats, and spin off projects such as breadability and a cli client. The big thing is that signups are now there as well as a landing page. So hopefully this will spike up interest in new users checking out Bookie. There are still a ton of long term ideas to work on with Bookie. I'd like to get a 'reading' view setup so that you can easily run through the bookmarks you've marked `toread`, especially in a mobile view. <3 my N7. I also want to work on getting suggestions for related bookmarks, suggested tags based on content, and other interesting machine learning type problems. If you're the type that takes your bookmarks seriously give it a try. If you don't want to run your own instance, sign up to https://bmark.us and try it out there. You can get an idea of the roadmap we're working off of on the Trello board. This week was spent on a big side project. I've been trying like mad to update the python-readability library and take it over to help use it in the Bookie project space. After spending a ton of time trying to do just this I gave up. I now present the breadability package. It's a fresh port from the arc90 readability.js using the knowledge I've gained from all the other work and trying to stick to the JS file that's the original inspiration. I've got a bunch more work to do to add tests, get it in the build server, etc. If you've been using one of the other dozen ports out there give this a shot. There's work to be done, but I'd love to get some real work use in there, let me know what sites don't work well, etc. Well, with all the great stuff going on with Bookie, I've gotten a bit buried in some big changes. The background processing and importing updates are going to take a bit to get right. This means, there's a great chance for others to hack up the little tweaks that we need to really add some polish to Bookie. So below I've listed a few ideas that should be pretty simple things to add, but with a really good positive and visible effect on the site. Now that invites are there, we should highlight a user's account navigation link to let them know they have invites available. I'll periodically add them to the system, and we don't want users to have to go to their account page each time to see they've got invites. I think a simple adding of one of the envelope/message type icons from our font-icon set would be perfect, with some sort of hover message to start. We might also want to highlight the block in their account page so it stands out that the invites are available. We want to be able to let users know things have happened successfully after doing something that redirected them. Imports are going to be doing this, saving/updating bookmarks, etc. It'd be nice to have a consistent type of ui to drop flash messages in and them to show after a redirect. When a new users starts up and logs in, they default to their own page of bookmarks...which is going to be empty. So we should detect this in our JS code that fetches the results and displays a set of default content with links to things like importing instructions, where to get the chrome extensions, and other handy new user tips. Some of this might also be nice to use for the email that a new user gets when they've been invited to Bookie. Ok, so this one is a bit more involved, but really, it's a single class and a couple of Python methods. 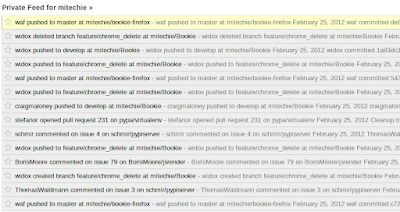 The hard part is reading in and figuring out how to match bookmarks to tags in Firefox's JSON dump of bookmarks. Once we get the Firefox extension rolling, it'll be great to have a good import system for the browser as well. Well, here are four things I'd love to see happen in the near future to help make the experience a level nicer for everyone. If you're interested in all or have any questions, ping me in #bookie in irc or shoot me a comment below. I'd be happy to help walk anyone through these or any other ideas you might have. Today we had the first Bookie sprint of the year. 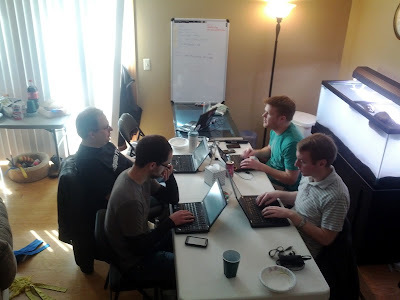 The five of us got together at my place for the main purpose of working on starting a Firefox extension for Bookie. We ended up pairing up into a couple different tasks. Will and Adam started work on the firefox extension. It looks like they started to get a feel around the sdk and some real progress got forward on that front. It's not quite doing API calls, but I'm excited about how that's going together now. Matt and Craig worked on some updates for the Chrome extension. We pushed a new updated 0.4 dev version with the delete functions restored and some spinner updates working. It took a bit of time to get things figured out, but what's nice is that the change was really pretty small once everyone got their heads around the JS driving the extension. In a way I like that adding in a feature was so little amount of code. Hopefully we'll be doing some more cool things with the extension going forward. I spent time working with helping people get up to speed. I also finally updated all the Python side unit/functional tests to pass after all the changes that have gone on under the hood. I also worked on fixing a bug where the API calls wouldn't work unless you had logged into the bmark.us website. Now API calls with valid username/api_key credentials should work just fine. This will hopefully reduce some confusion with getting the extensions going. We're down to the last few items to getting the 0.4 release out the door. I'm excited with the changes in this release and really excited to start tackling some exciting new changes in my time at PyCon next month. I hope to sprint on some user registration backend and some background processing of tasks. That should get me back into some fun Python side of things vs all the JS code I've been doing recently. As always, we'd love to have help with any of these projects and anything else you'd like to see updated in Bookie. Hop in irc at #bookie and let's chat. Thanks again to Will, Craig, Matt, and Adam for a great time sprinting and getting a lot done today. Always good to see others getting interested and involved in the work you do. Maybe one day, we'll get a real community going around Bookie. That'd be awesome. Now that I'm going to be working for Canonical I've got to get ready for some week long sprints. Now, I LOVE my 12" X201 thinkpad. It's the best laptop I've ever owned, and I've owned macs, toshibas, dells, and larger thinkpads. When I'm home, I dock and use dual 21" displays. When I travel, it's the perfect size, yet still packs an i5 and 8GB of ram. However, a week of living inside a 12" display has me a little claustrophobic. So I decided I should do something about it. They make some decent looking USB powered external monitors that seemed like they'd travel pretty nice. Once cable, no external power needs, and another 1024px is a good thing. Mobile mutli-head..sweet! Once you install xserver-xorg-video-displaylink you'll need an xorg.conf file since DisplayLink doesn't work with all the hotplug business that makes modern video work. The real trouble is that I ONLY want this xorg.conf file when I'm actually using the USB display. When I'm docked at home or using a projector, I don't need it. Right now I've just written a toggle script that I use to flip the xorg back and forth. There are also some usage issues. It only works for me if the DisplayLink monitor is the primary one in the xorg server setup. This means the LightDM is running on there and it's running in just a few hundred pixels of the display. I can still log in though so it's not killer. You can't drag windows back and forth among them, which isn't the end of the world, but some apps (like Google Chrome) only launch on the same display as the currently running instances. So I can't find a way to get Chrome to run on both monitors. For now I just run Firefox on one and Chrome on the other. Overall, I'm really digging the setup. I'm sitting at the bar with irc on a second display while I write this blog post out all unplugged from any power. I think it'll make life a LOT nicer for road traveling for any extended time.